NEW: Top Trader Contest - Chance of managing over $1,000,000! ForexSignals.com is giving our community members the fairest chance of becoming a professional trader and managing millions of dollars. The team here have been working hard behind the scenes in bringing you a transparent and exciting new opportunity anyone can take part in. We're not just assessing how much money you've made but instead we're wanting to see (irrespective of your balance size*) how much risk you took for the gains you've made. This means that those with a smaller balance have the same chance of becoming our next Top Trader as someone who has a 6 figure balance. So how are we assessing who is classed "better" than another trader? We're looking for a trader who can demonstrate consistent risk management. Those who have sporadic or erratic returns (e.g. large outlier losses) will not receive a better ranking score than someone who has demonstrated consistency. Unlike some trading contests, you'll be pleased to know that we're not marking up your spreads of trading commissions either! Entry into this contest will also enroll you into the "Monthly Top Trader" contest too! So what are you waiting for? Join the Public Trading Room to learn more about how to join this contest! Hurry though, time is running out as we're due to launch our first Monthly Top Trader contest on the 1st of February! All entrants must have their accounts synced prior to the 1st of February to be eligible for cash prizes in that month! Hey Dom, thanks for the invite. I signed up (1st person ) and can't wait to be part of this. This is a unique experience and I love what you've done with it. Does the million dollars come from a broker or does it mean they will be the next Jay and Hans? Just to let people know as they might have the same issue, I opened an account 2013 with a different IB and they wont change the IB to this one. The only solution is to open a new account with a different email address they tell me. Could I ask you to please send me a private message and I will look into this for you straight away! Can USA traders join the contest? At this particular moment in time, this is not an option for US clients. However, we are working hard behind the scenes in trying to find a way to allow US clients entry to it. Keep an eye on this space and the trade room. Also guys if there is something you feel would enhance the competition please feel free to give us your thoughts and feedback. We've built this over the past few months and gone to great depths to try and make sure it's what people want but obviously feedback is invaluable and as always we will do our best to accommodate any suggestions. It's great to see people getting involved already. A few people have said to me that they are worried that they won't be good enough… But I would say it's worth getting involved just for fun. We can see your application - fear not, we're just in the process of verifying if your account is under our IB ID (1619). Please keep an eye on your email inbox for further instructions / confirmation. That would be great and even better with more broker options. Tallinex, TradersWay, FXchoice for USA and pepperstone, axitrader, globalprime, fxpro, lmax, mtcook, and others would be appreciated. Can you guys explain the global leader board more and how allocation will work? Will this be similar to Darwinex where Fund allocation goes to the top 3 traders each month. We're looking for our next team trader / trading partner to manage our capital, brokers and clients in a managed account. 2 days left before February top trader contest starts (cash prizes are being awarded to 1st, 2nd and 3rd places!). 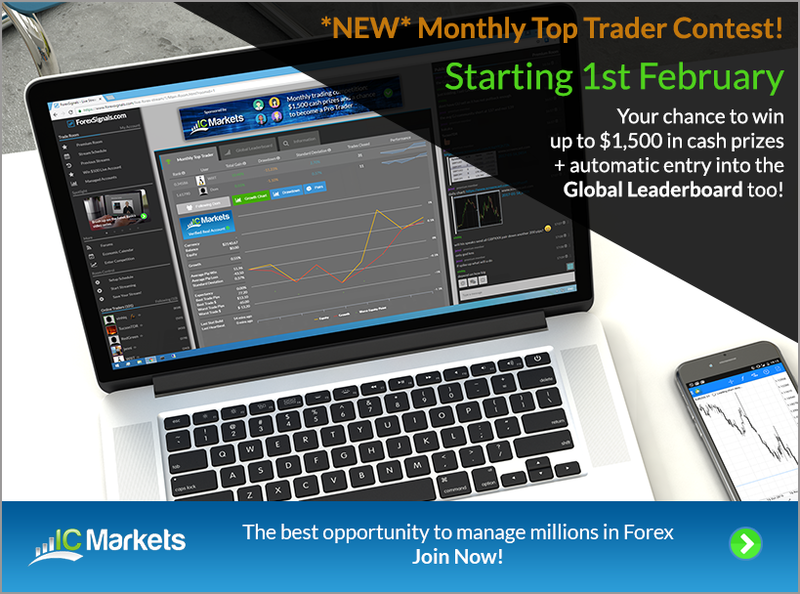 Entrants after the 1st of February will be entered in to the March Top Trader contest. Thanks Dom. 3 months on the leader board and 9 month track record without using martingale will be an interesting battle for AUM. Are there any other strategy qualifications or limitations that are in place? Also I like how the max drawdown isn't an issue, so we can basically trade as aggressive as we see fit and the scoring is based on the adjusted return/ dd. Then, your company can reduce the exposure to what ever is necessary to stay within your company's maximum drawdown threshold. Great Idea.